One of the main elements that we tend to stress to students is the process of internalisation, of bringing knowledge and skills inside oneself and of making one’s own. At the same time, we also stress the ability to externalise, in the sense of being able to articulate that knowledge- and skill-set to others, most obviously through assessment. This week, I have been finding myself in a similar situation, as I prepare my teaching notes for the coming semester. Since I am of the opinion that teaching should not bear much resemblance to a murder mystery, I like to make my powerpoint slides for lectures available at the start of semester, so students can know roughly what I’m covering. However, since both my modules this time round are new, I still don’t know exactly what I’m going to say. Indeed, in recent years, since I’ve gone further into different pedagogies – all of which stress student-led learning – I’ve found lectures more and more problematic. Last semester’s use of podcasts was very good for that particular situation (allowing me more time to have practical activities) and highlighted the benefits of moving away from the passive classic lecture model. In future years, I’m certainly going to look at moving all my lectures to podcasts. This semester I have a somewhat different situation, since my Intro to the EU module is split into separate lecture and seminar slots. While I know what each week will cover, I’m also aware that this has historically been a subject that suffers from a poor image and which students often struggle with basic concepts. 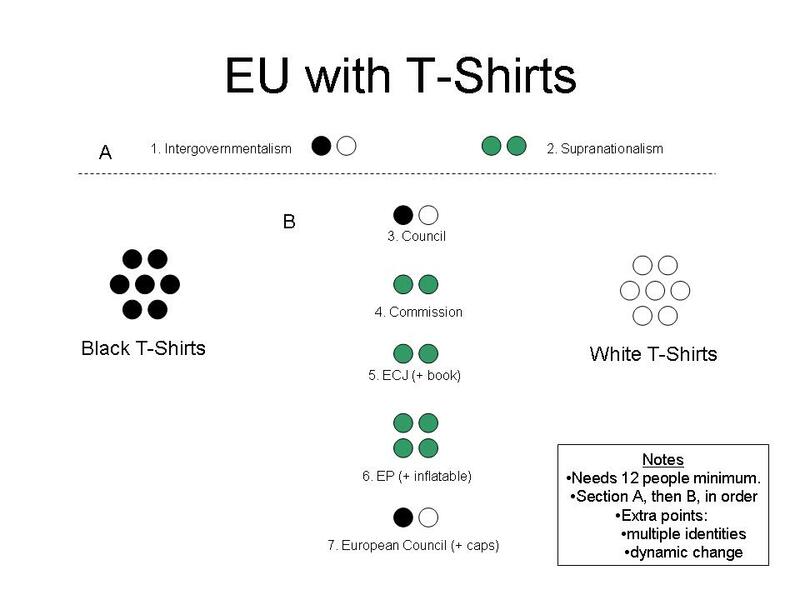 While I will be using some activities such as ‘EU with t-shirts’ (below), I also want to retain some flexibility in my lectures to match student progress. The upshot of this is that my lecture notes have become ever briefer. While this merely confirms my status as the faculty member with the most telegraphic powerpoints, I’d like to think that it will also benefit students. Instead of feeling that they can just take my powerpoints and use them for revision, they will instead need to attend my classes in order for those keywords to make real sense and for them to be able to internalise that for themselves. That’s the theory: only time will tell if it pays off.